I am loving these masterpieces created out of everyday stuff. 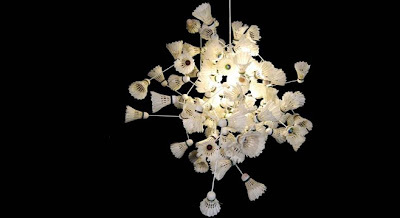 Just look at this whimsical chandelier made out of shuttlecocks...pretty isn't it? This one has been created by Designer Gitta Schwendtner. I bet you can't even guess what this chandlier is made up of. Here...here... let me give it away, plastic bags...yes the same ones that have been banned at Delhi. Spectacular!! 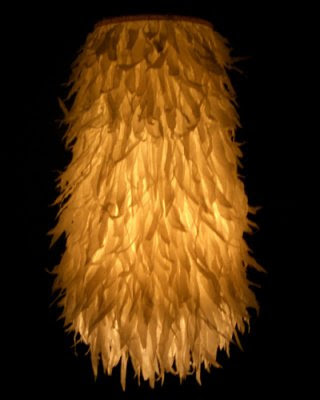 British Designer Monica Hughes has created this warm and feathery lamp. Ooooo...these super cute blossoms are made out of spoons. Designer Francois Legault is the guy behind them. Won't they look ultra cool above my dining table or even in my kitchen? My favorite...or wait, those cute spoons are my favorite too ;) Created by artist Tracey Johnson these lights are made up of wine crates that she collected. She cut them up to mimic branches of trees and retained the wine company logos. Wow, now that is really neat! Pretty.. so pretty... what an eye for beauty.. to make the ordinary so beautiful.. I love this kind of imagination!!! Something that's right in front of us everyday! I just found your log on Pinterest ...Love your stuff...I'll be back often. 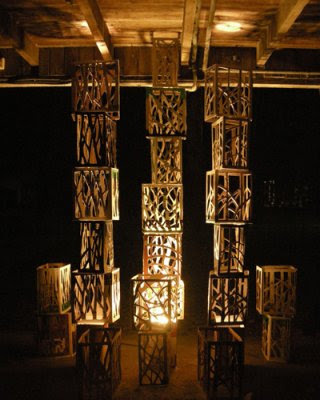 Lovely light fixtures! 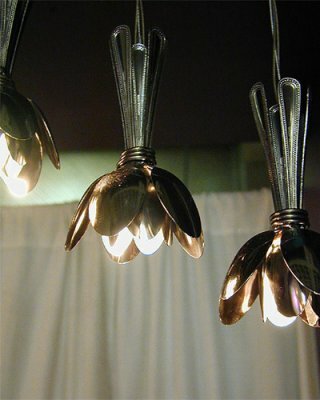 I especially LOVE the spoons. That would look GREAT over a kitchen island. This is just beautiful n gorgeous I love it! ! !.